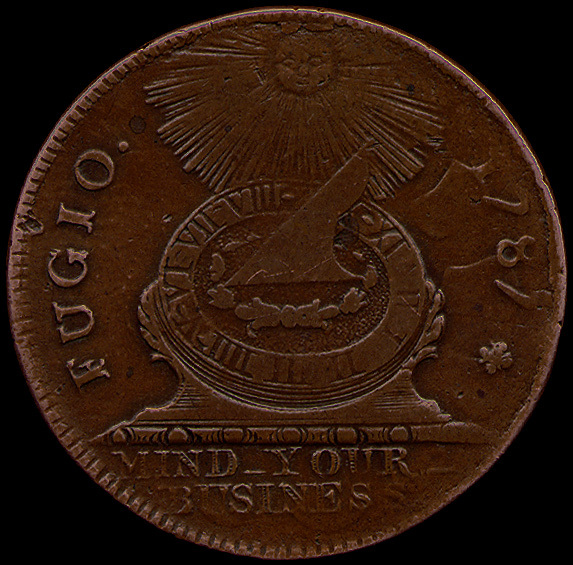 Comments: This is the only fugio variety with a cross shaped ornament after the date rather than the usual cinquefoil design. 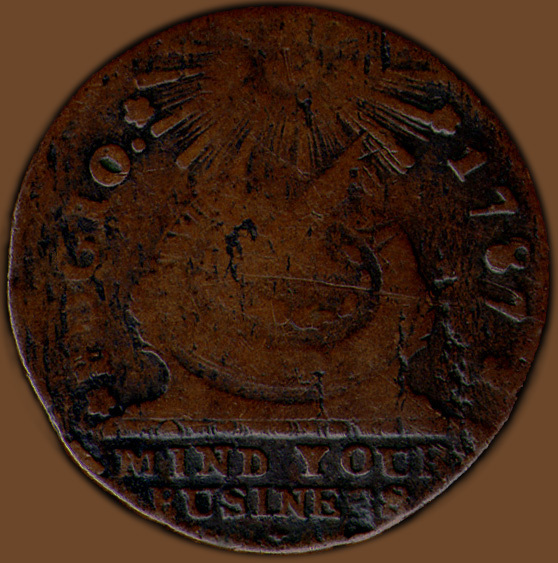 Also, the legend in exergue, "MIND YOUR BUSINESS" was hand engraved into the die rather than punched, note the detail within the letters and the replacement of the normal ornament found between the words with a simple line. 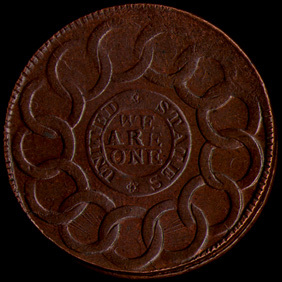 The reverse is a variety with United States. A peculiarity of this reverse is that when the die was first made the word ONE was punch set where the word ARE should have been. This mistake was corrected by deeply punching the letters A and R over the incorrect O and N. In the following detail note that the outline of an O can be seen around the A - Click here for the detail. Because the illumination is from a different angle in the illustration above the O is less evident but the final stroke and the top right serif of the N can be seen behind the R. The final E which did not need to be repunched is weak and leans to the right. 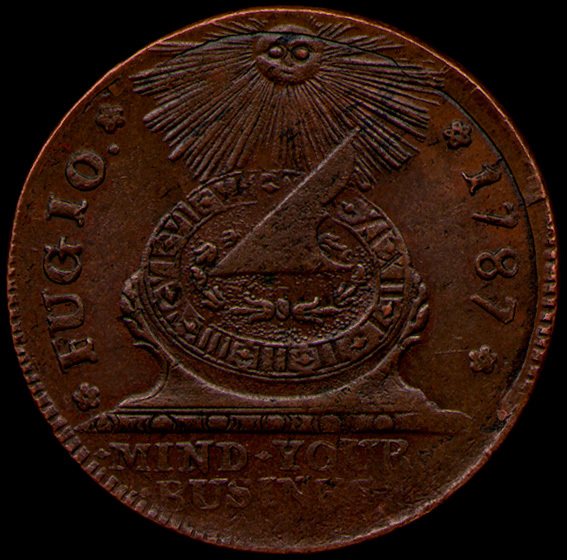 This coin shows evidence of a die clash, that is, the obverse and reverse dies were struck together without a planchet between them, thus causing damage to the dies. On the reverse at the top from ring 13 through ring 3 is the impression of MIND YOUR BUSINESS. Ring 13 also has part of the ornament on the base of the sundial. The clash can be seen on the image above. The following two details show the clash with the coin turned upside down so the legend is more readable. 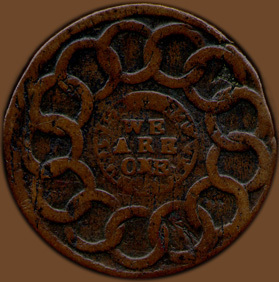 The first detail shows the clash as it appears on the coin, with a "reverse image" of the text. - Detail 1. The second detail was created using techniques available in our Adobe Photoshop program so that the image is actually inverted and can be read from left to right - Inverted detail. 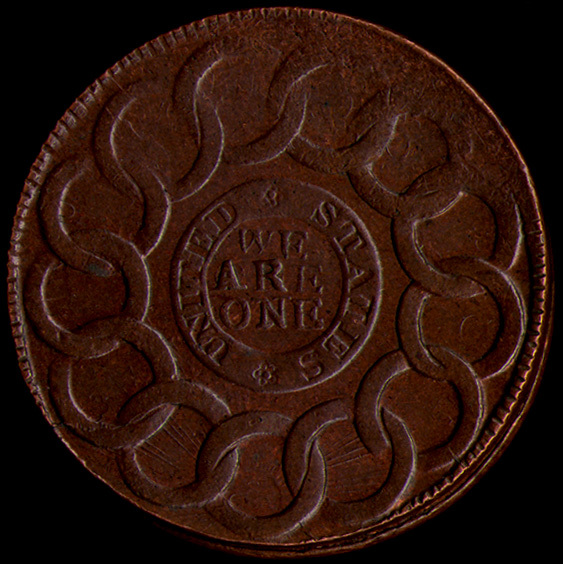 Also, on the obverse are three shield shaped marks under the area with the date and the cross. These are from the impression made by the inside of linked rings 6, 7 and 8 during the die clash. Additionally, the impression of rings 1 and 2 can be seen below the exergue legend. 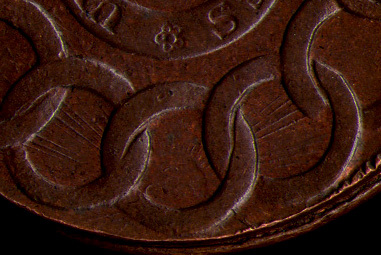 Rotated and inverted images of the entire obverse and reverse follow so one can see the clash marks in what would be their "normal" location on a coin - Obverse and Reverse. 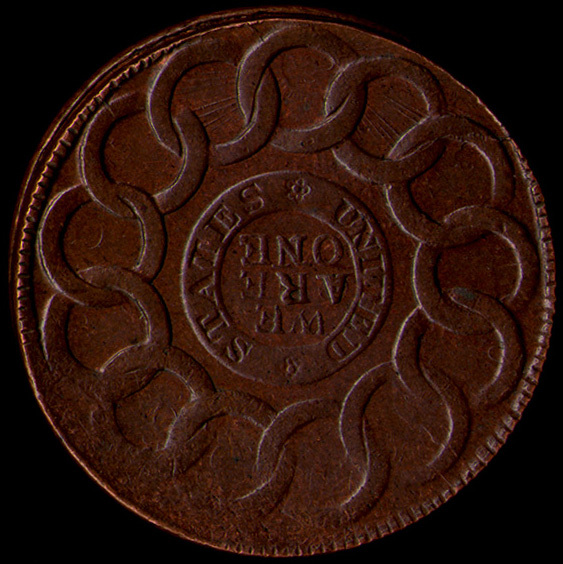 On the reverse there are also some small die breaks on the outside of rings 9 and 10, both toward the rim. 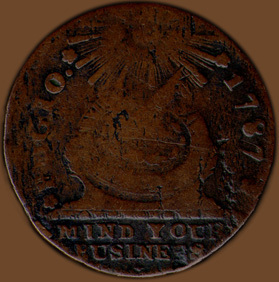 This particular examples also has some scratches and planchet voids on both sides. Comments: Note that there are no ornaments in the obverse exergue legend of club ray fugios. 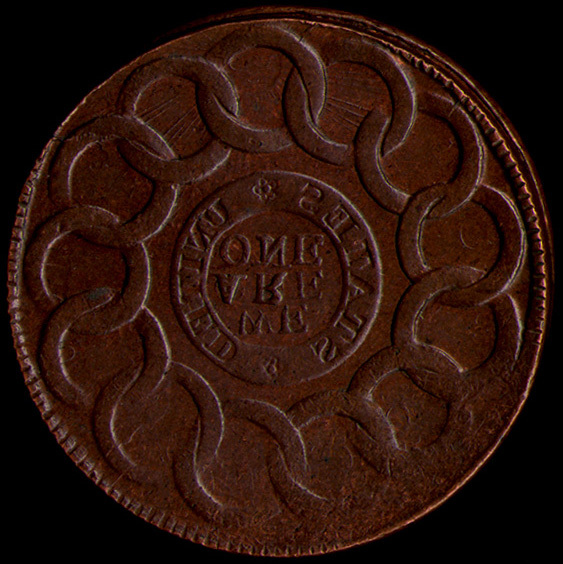 This is one of two obverse convex varieties. This example is designated as from die 4 because the Y in YOUR is alligned between the N and E below it (in die 3 the Y is below the last stroke of the N) and in YOUR there is a large space after the letter Y but the letters O and U are very close together (they are more evenly spaced in die 3). 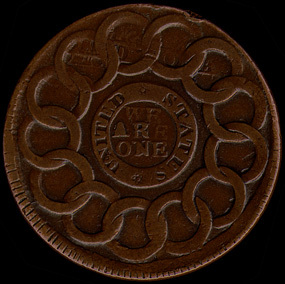 Obverse 4 is only found with reverse E. It is quite similar to reverse D (used with the other convex club variety, die 3) but in reverse E the NE in ONE are very close together and almost touch, they are further apart in reverse D. This example has planchet voids on both sides most notably at rings 3 ,7 and 11-12 and on the obverse going down the to the rim from the right of the sundial. 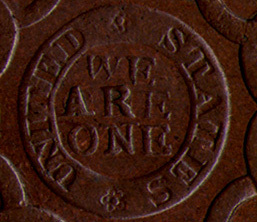 Comments: The B reverse die was used with obverse die 1 as well as ponted ray obverse dies 8 and 11. Both 8 and 11 are similar but can be distinguished in that on obverse 8 after the word FUGIO one tip on the cinquefoil points at the period and the final stroke of the N in MIND is over the center of the U (in die 11 the strokes of the N are directly over the strokes on the U). 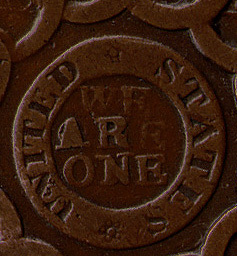 As mentioned under 1-B a pecularity of this United States variety reverse is that when the die was first made the word ONE was punch set where the word ARE should have been. This mistake was corrected by deeply punching the letters A and R over the incorrect O and N. In the following detail the outline of the O behind the A and the final stroke of the N under the R are visible - Click here for the detail. In the word ARE, the final E, which did not need to be repunched, is weak and leans to the right. On the obverse note the cut along the rim from the base of the sundial at about 4:00 o'clock continuing around to just above the cinquefoil after thre legend FUGIO at about 10:30 o'clock. 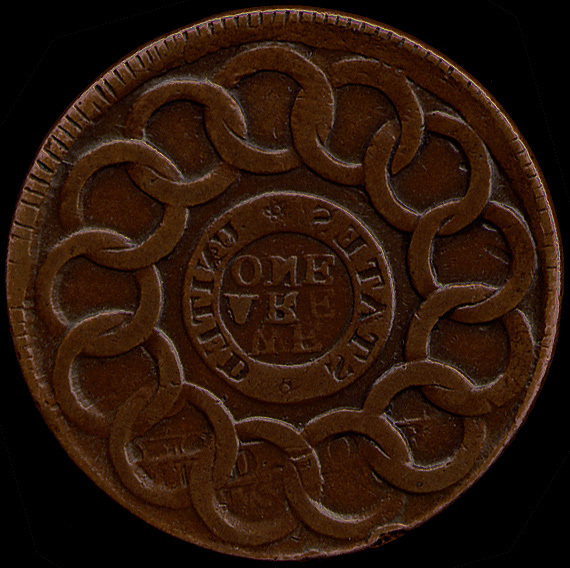 This extra cut was made by the automatic planchet cutter, which cut out the planchets from rolled sheets of metal. This is further evidence that the tool has two sharp knife ends and used a circular cutting motion to cut through the metal (rather than a punch used to stamp out the planchets) as described by James Spilman. (see: The Colonial Newsletter , vol. 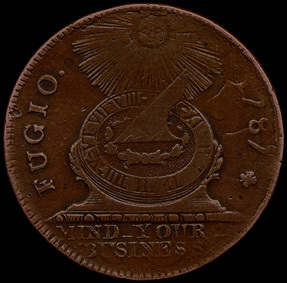 21, number 2 of July, 1982, serial number 63, especially page 789 which shows another fugio 8-B with a similarly placed planchet cutter mark). On the reverse on can detect traces of a heavy die clash. 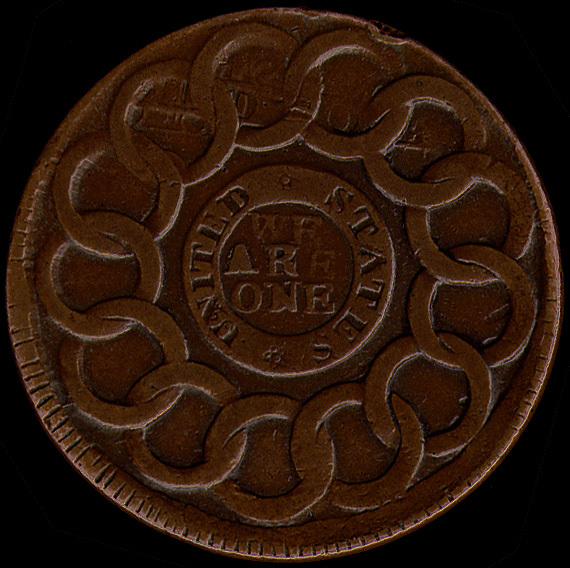 The two clickable images show the clash with the coin turned upside down so the outlines are more noticeable. The first image shows the reverse turned upside down - Image 1. The second image goes further. 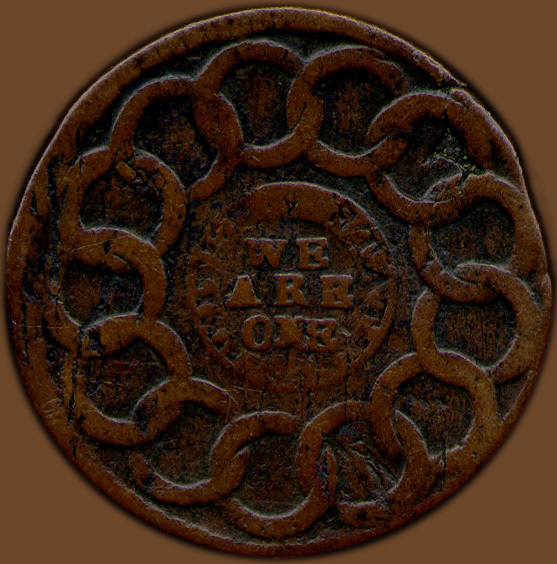 It was created using techniques available in our Adobe Photoshop program so that the image is actually inverted thus the clash imprints can be seen as they would appear on a normal obverse - Image 2, inverted. As some of the imprints are difficult to see in the images displayed above, for the following discussion I have included details made at 600dpi. 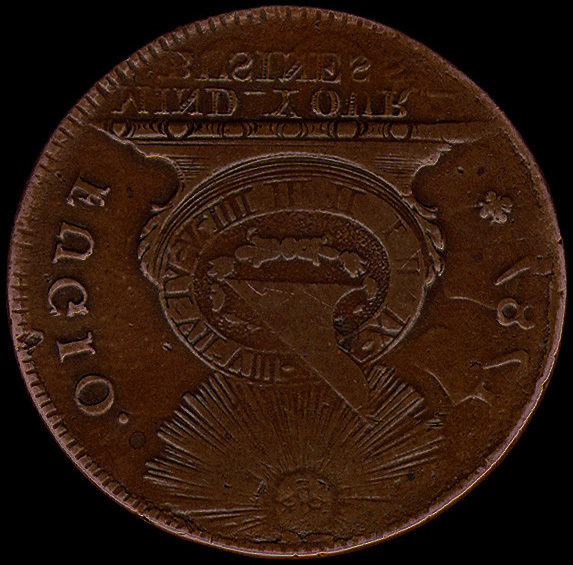 In each case the first detail shows the coin as it is and the second detail shows the coin rotated and inverted to give the appearance of how an obverse would look. Please remember - in the inverted images the rings will appear in reverse order! Rings 7-9 show the rising sun with the face in ring 8 and the rays in rings 7 and 9 - Rings 7-9 and Rings 7-9 rotated and inverted . In rings 5-6 part of the date can be seen. Most of the 8 is visible in ring 5 and less visible in ring 6 is a small part of a cinquefoil and the bottom half of the 1. - Rings 5-6 and Rings 5-6 rotated and inverted. At rings 13-3 are faint outlines of the base of the sundial and the legend in exurge. 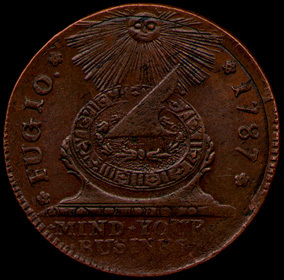 This area was weakly struck so that the imprint can only be seen on the coin by tilting it in the light. It is even more difficult to discern on the scanned images presented here. 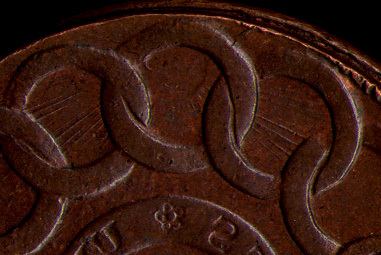 In ring 3 the small impression that looks like a comma or part of an O is actually part of an impression of the design on the base of the sundial. - Rings 13-3 and Rings 13-3 rotated and inverted. Finally in rings 10-12 are traces of the legend FUGIO. In ring 10 near the link is a cinquefoil, 11 is the bottom half of an I and a small part of t G, while in ring 12 is a large part of the U - Rings 10-12 and Rings 10-12 rotated and inverted.